Joe Belmont has been a professional guitarist for over thirty years, and has extensive performance and recording experience in a wide variety of styles with many musical ensembles. His discography from intimate solo work to session musician to film scores. He is a Performance Faculty member of the music department at Amherst College and is the Director of Jazz Studies at the Northampton Community Music Center. Joe was born in New York City. After dabbling with other less worthy instruments, he found his passion in the guitar. He taught himself to play and began writing songs almost immediately. Soon after, he formed long-standing and popular NYC band, Charlie Quasar, with his bro Dave Belmont, bassist Jerry McCord and drummer Ritchie Epstein. Toward the end of the band’s tenure, Joe began music school, studying at the City University of New York, and receiving a BA in 1977. After graduating, Mr. Belmont disappeared into the hinterlands of Western Massachusetts, having fallen off the edge of the flat earth, as defined by The Map in New Yorker magazine. Actually he settled in Northampton, MA. Joe immersed himself in the music scene there, playing a dizzying variety of styles, with numerous bands. Memorable were stints in the rhythm and blues band “The Hamptones”, singer-songwriters John Coster and Joel Zoss, and jazz-fusion bands Urban Renewal and Fresh Squeeze. In 1986 he released a cassette(!) of his acoustic guitar compositions entitled “First Edition”, which became a local best-seller. Since 1990 he has taught Jazz guitar as a performance instructor at Amherst College, Amherst, Massachusetts. Joe played guitar, arranged and wrote music for the band Quetzal (Viva Quetzal.com) from 1991 thru 2003, recording three CD’s and traveled to numerous shows at festivals, Fine Arts Centers, and other venues all over the USA. In 2003 Joe began his solo career, first releasing the CD “Sketches from the Journey Home.” “Sketches” is a collection of intimate guitar pieces, each depicting an aspect of Joe’s life. (Read a review here. Listen to MP3s here.) Following this CD, Joe recorded another entitled “Live at Leeds (Northampton),” released in June of 2005. Joe then embarked on a two year project transcribing and learning the music of Wes Montgomery, and teamed with some wonderful musicians (Paul Arslanian on piano, Dave Shapiro on bass, Claire Arenius on drums, Bruce Diehl on saxophone) to produce the CD “Joe Belmont and the Fellowship of Wes,” released in 2007. In 2010 he released (along with flutist Sarah Swersey) the self-titled “Duo Fusion” CD (www.duo-fusion.com). In 2013 he served as Music Director for the world premier of Grammy and Tony winners Steven Sater and Duncan Sheik’s play “Arms on Fire.” He is currently writing music and getting ready for The Joe Belmont Experience. The Joe Belmont Experience is a trio of accomplished veterans of the Northeast music scene . They perform the first Sunday of every month at Hawks and Reed in Greenfield, playing their compelling and cohesive blend of the diverse styles of jazz, original compositions….funk, classic songs…..Chicago blues…. Viva Quezal is back! 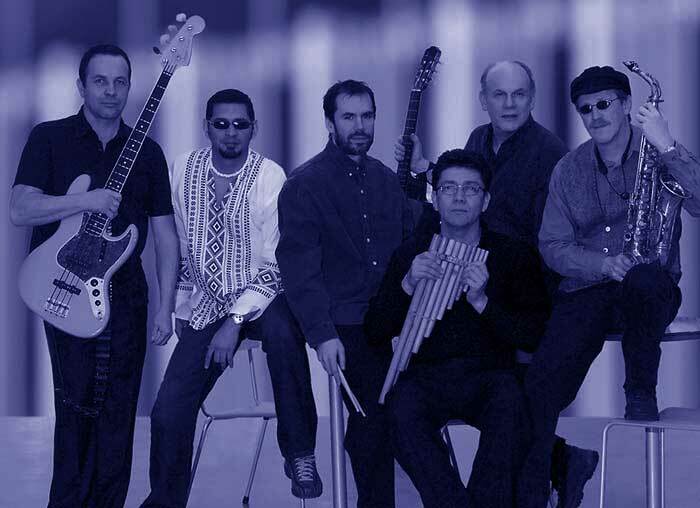 Joe is happy to rejoin this innovative world beat band… George W. Bush is long gone and Viva Quetzal is back. To learn more about our upcoming gigs, visit www.vivaquetzal.com. Joe is proud to collaborate with acclaimed flutist Sarah Swersey. 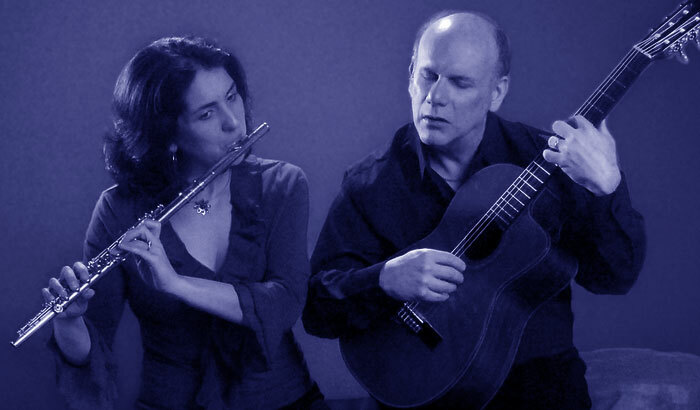 Together they explore music from classical to jazz, Bach to Ibert, Fauré to Celtic Improv. For their recent CD, visit their CD Baby page. For more about Duo Fusion, visit http://www.duo-fusion.com. Folks: This should be a really great night! It will not be COLD in this room…. Joe Belmont has been identified as a master teacher. For more than twenty years he has taught jazz guitar on the Performance Faculty at Amherst College in Amherst Massachusetts. Joe is also currently Director of Jazz Studies at the Northampton Community Music Center in Northampton, Massachusetts. Joe’s comprehensive background and his experience teaching talented guitarists of all ages enables him not only to guide his students towards a mastery of technique, but to find the style most appropriate to them. Joe not only knows how to play but how to listen. For information about lessons, fill out Joe’s contact form below. Here’s what a few of Joe’s students have said about him. Where applicable, feel free to follow the provided links to see their work or to contact them yourself. “This week when I walked in during my son’s guitar lesson with Joe, they were discussing Spanish rhythm. This used to surprise me, now I’m used to the range. Joe played guitar and showed him by example this type of strumming, while my son was asked to tap his own guitar with a base rhythm. Then Joe and he swapped roles and Joe said, “give it a try”. The first time he did this, I watched with anticipation to see if my then 10 year old was up to the task. He did it, chord for chord. This back and forth is a blast for my son. Joe has not only broadened his appreciation for music, but has instilled a confidence in him as they play this game. As Joe weaves in many points of view with melody, music theory and rhythm, I get to watch my son blossom with inspiration. He has learned a bit of jazz, blues, classic rock and now classical Spanish in this manner. They listen deeply and discuss music or Joe hands him a disc to take home at times. Sometimes I arrive and they are just laughing together and playing – it’s natural, it varies, and that’s the magic of it”.